This page will self-destruct in 5 seconds... not! for a stroll and some culture before or after your mouth watering meal here is... and we love it because the collection is so varied, you can be sure to find something to interest everyone. The recently restored building now glows beautifully, showing off the glorious sandstone its made from. ... so do you want to know what's keeping those 'in-the-know' folks talking about Ad Lib West End? It's... how much fun it is, trying to decide that to choose from the interesting Ad Lib menus! With so many dishes available nowhere else, it can get quite hard work...;-) And as for those burger toppings - amazing stuff! Enjoy! Now... don't tell anyone else. And DO NOT reveal this Ad Lib West End top secret file and password. We'll know.... And we'll track you down and sneak little sticky "dafty!" labels onto your back! And get yourself onto the VIP list below while it's still open, and I'll drop you a short email every time we reveal something new about Ad Lib West End. And remember you can grab your own page here to share your tips, photos and stories about Ad Lib West End. Have fun! Great news! Finding this page means you can now join our VIP list for Ad Lib West End. You found the Top Secret File for Ad Lib West End. 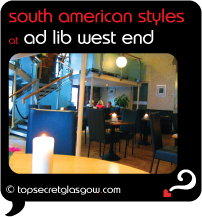 If you don't have a password yet, there are still lots of great things about Ad Lib West End in its Buzz Page. ("The Buzz" page is also the place to pick-up the password by taking part).